Lobe-finned fishes—the sarcopterygians—rose during the Early Devonian Period and were the first dominant group of bony fishes. Their numbers dwindled by the end of the Paleozoic with the rise of the ray-finned fishes, but not before some members of this group evolved to become the first limbed vertebrates. Four groups of sar-copterygians are recognized. • Porolepiformes: an early group of sarcopterygians, now extinct. • Osteolepiformes: advanced group of sarcopterygians, now extinct, although they are the ancestral roots to land animals. • Actinistia: the coelacanths, the only marine form of lobe-finned fishes that survives to this day. • Dipnoi: the lungfishes, which are still represented by three living freshwater species. Of these groups, the osteolepiforms appear to be the best link between fishes and terrestrial vertebrates. These fishes had a more efficient arrangement of fins than the porolepiforms, with the os-teolepiforms' fins concentrated more toward the midpoint of the animals' long body than the porolepiforms'. An early clue to the evolution of tetrapods is also seen in the consolidation of anterior skull bones in the osteolepiforms. In more basal lobe-finned fishes and lungfishes, the bones of the snout were an unpatterned mosaic of many small bones. 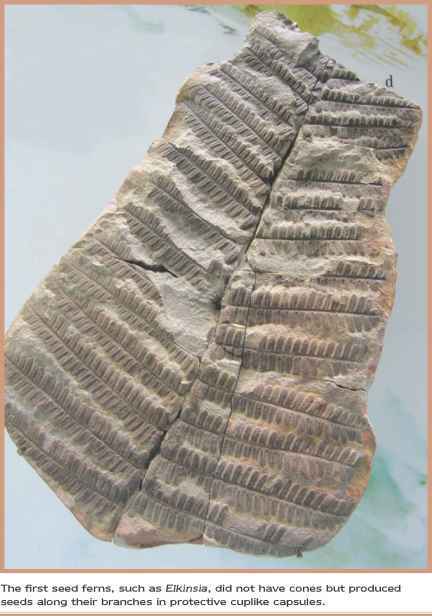 With early osteolepiforms such as Osteolepis (Middle Devonian, Scotland), these bones had already begun to consolidate into the more fused and robust pattern seen in tetra-pods. Following are representative sarcopterygians. Eusthenopteron was likely an aquatic ancestor of tetrapods. the animal is best known from Miguasha, Canada. It was a large fish, measuring up to four feet (1.2 m) long. Several intriguing anatomical features make Eusthenopteron an excellent candidate for an aquatic relative of tetrapods. Most importantly, the bones of its pectoral and pelvic fins include many of the important features that would be needed by a walking creature, giving it ancestral arms and legs in the form of fins. Other features that unite Eusthenopteron with early land animals include the makeup of its teeth, the design of its spine, and the arrangement of bones in the front of the skull. Tiktaalik (Late Devonian). One of the newest specimens to be added to the list of transitional fish-tetrapods, Tiktaalik was described in April 2006 by Ted Daeschler. Working in the Canadian Arctic, Ted Daeschler, Neil Shubin, Farish Jenkins, and their team recovered three partial skeletons and many isolated elements of this startling fish that represents a key stage in the transition of fish to land. A composite of the three specimens provides abundant information about most of the front half of the fish, including remarkably complete skulls, pectoral girdles, and front fins, all preserved in their original articulated position. The suite of skeletal features shows that Tiktaalik was clearly a fish with adaptations for life in shallow aquatic ecosystems and perhaps for staying out of the water for short periods of time. Its body and head were flat, with eyes on top, reminiscent of crocodiles. Its nostrils were on the side of its head, closer to the mouth, like other transitional fish-tetrapods. Its ribs were wider than those of a fish, suggesting that Tiktaalik was somewhat capable of supporting its weight out of the buoyant medium of water. Tiktaalik had a neck, a feature not seen in true fish but one essential for an animal that must lift its head out of the water to breathe air; the neck also is essential to provide an animal with sufficient flex and mobility while walking on land. The skull includes evidence of gills for breathing in water as well as structures that would have aided buccal pumping as in early amphibians. Tiktaalik is even more evolutionarily significant because of its front fins, which had bones similar to those in the forelimb and wrist of a tetrapod. The wrist design of Tiktaalik has great affinities with elements that still can be seen in land animals today. Neil Shubin explains that Tiktaalik "tells us to a great extent how parts of our own skeleton evolved." The geology of the Arctic site where Tiktaalik was recovered shows that the environment was that of a small stream in a tropical or subtropical river delta. Tiktaalik was most at home in shallow waters, where it probably rested in wait for passing fish and arthropods that it could snap up with its formidable jaws. Its flexible neck, respiratory options, limblike fins, and enlarged rib cage suggest that Tiktaalik could have thrived as a shallow-water predator while also leaving the water on occasion to exploit its opportunities on land. This remarkable creature, heralded as a missing link of sorts in the world of tetrapod discoveries, demonstrates that shallow-water habitats were the evolutionary proving ground for the first tetrapods. The term missing link is misleading, however, because it suggests that Tiktaalik is the direct ancestor of tetrapods— something that cannot be known from the fossil record. "Tiktaalik is a link," says Daeschler. "It certainly was missing. But there are plenty more links to find in any evolutionary sequence." Tiktaalik 's combination of fish and tetrapod features makes it somewhat difficult to classify, but it represents precisely the kind of animal that paleontologists would expect to find as a diverse group of many families of fishes gradually evolved an affinity for living on land. "Evolution proceeds slowly," explains Daeschler. "It proceeds in a mosaic pattern with some elements changing while others stay the same." Panderichthys (Mid to Late Devonian). Two species of Panderich-thys are known from several excellent specimens found in Latvia and Russia. At three to four feet (1 to 1.5 m) long, the animal was an inhabitant of coastal swamps and lagoons. This taxon also represents a transitional form between waterborne fishes and tetrapods, though it does not show several of the tetrapodlike features seen in Tiktaalik. Panderichthys is distinguished from its contemporary Eusthenopteron by a lack of dorsal fins and a much more tetrapod-like fin structure. 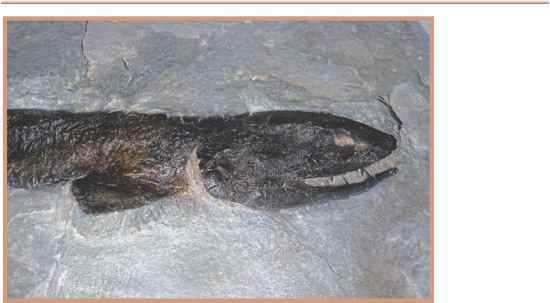 Its skull was long and flattened, and the eyes were located toward the top of the head. Both of these traits are seen in later tetrapods.